How are stars born?, How do they die?. How can we be sure of something we can not observe?. In this talk, I present the "state of art" of the star formation, explaining how newborn starts evolve and die. I remark the main physical concepts involved in the theory, and I explain how the use of technologies like the IT's are involved. 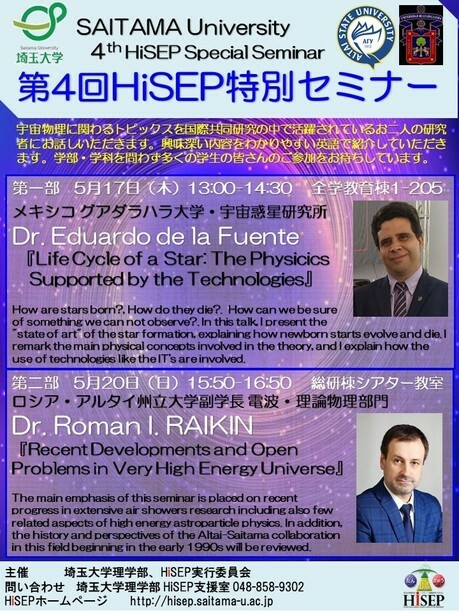 The main emphasis of this seminar is placed on recent progress in extensive air showers research including also few related aspects of high energy astroparticle physics. In addition, the history and perspectives of the Altai-Saitama collaboration in this field beginning in the early 1990s will be reviewed.